Sour Cherries are high in fiber, vitamins and potassium. More recently they have also been promoted for the significant amount of antioxidants they contain. Montmorency Cherries in particular have become the object of intense scrutiny in sleep studies. Researchers from the School of Life Sciences at Northumbria University have found that Montmorency cherry juice significantly increases levels of melatonin, the hormone which regulates sleep. Subjects in the studies who drank cherry juice daily not only slept more soundly, but slept an additional 25-34 minutes a night. And if the health benefits are not enough, the cherries taste great, too. Montmorency cherries are the most popular pie cherry in America. Nanking Cherries are beautiful red, semi-sour cherries. Unfortunately, they are also small and soft and therefore tedious to pit. Most people just cook them whole and strain out the juice for jelly. However, my favorite way to eat them is to freeze them with a little sugar and a touch of almond extract. In the middle of a cold, dark January day they come out of the freezer bright red and tasting like summer. Unfortunately, that means pitting them in the summer. I pick a lovely summer day, dress in grubby clothes, put on some music and sit in the yard pitting cherries with a straw. It's messy, but well worth it in January. 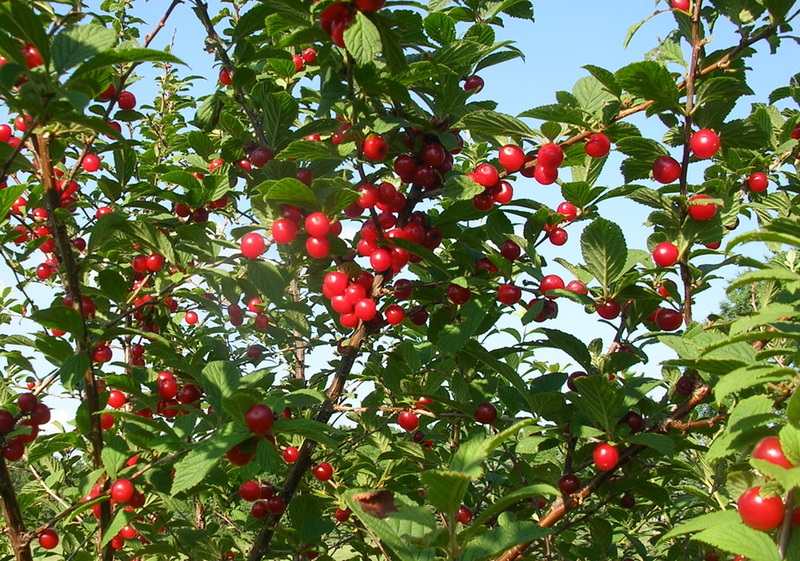 Nankings can also be used in pies, cobblers and cakes - anywhere sour cherries would be used. Combine ingredients with a dash of salt and let stand for 20 minutes. Pour into a 9 inch pie shell. Dot with 1 Tbsp butter. Adjust top crust (lattice is traditional). Bake at 400° for 50-55 minutes. Mix cherries, juice, ¾ cup water, sugar and salt together in a saucepan. Bring to a boil. Dissolve cornstarch in remaining ¼ cup cold water and add to the cherry mixture and boil, stirring continually, until the pudding thickens. (Serve with whipped cream). Combine oatmeal, soda, margarine, flour and salt. Spread ½ of the mixture in a 9 x 13 inch pan. Combine sugar, cherries, cornstarch and vanilla. Pour over oatmeal and bake for 10 minutes. Sprinkle reserved oatmeal mixture over top and bake 20-25 minutes longer.